Q :: I'm interested in seeing and potentially buying in Cavalero, now what? Q :: Are there more homes for sale in Cavalero than shown on this page? Q :: Where does Persinger Group get information about Cavalero real estate? Q :: I'm a Cavalero Homeowner thinking about selling my Cavalero home. Can you tell me what you think my Cavalero home might be worth and what you do to market and sell homes? Cavalero area can be a bit confusing. Because you have different spellings of the parks, roads, schools, area, and specific sub-division. For example, the Cavelero Mid-High School is spelled with an "e". But the area is spelled with "a", and so is the specific new sub-division of Cavalero Ridge. In the last 365 days, 31 homes have sold in the Cavalero area. The average Days on Market for Cavalero homes was 97. Meaning it took 97 days from the time a Cavalero home was listed for sale until an accepted offer. 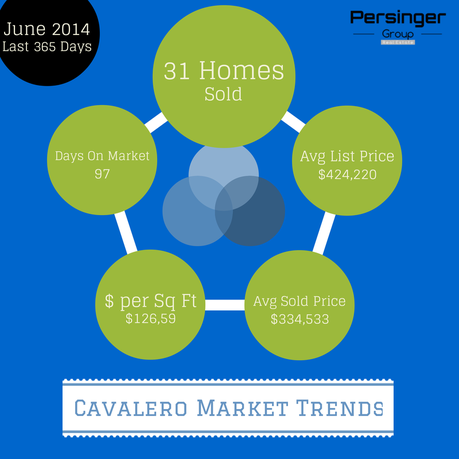 The average selling price for a home in the Cavalero area is $334,533. With the average list price being $424,220. The average list price at the time of sale was $324,507. Meaning homes in Cavalero are selling at 101.87% of the list price.